Fancy. Weird. Delicious. Well I’m Flattered, But No, We’re Not Talking About Me Silly! And here we conclude the BARBEQUE FEAST/DESSERT EXTRAVAGANZAAAA trilogy that began many moons ago…or like one moon ago. How does that phrase work exactly? Anyone? Ok, while we all figure that out, let’s chat about shaky ground. I’m feeling like I’m on some. Maybe that’s too strong, but I’m still feeling pretty down. There was one day this week where I’m fairly sure all I ate were chocolate chip banana pancakes, peanut butter, vanilla ice cream and more peanut butter. Life has not been filled with rainbows, friends. It’s been filled with peanut butter and tears. And that is not a blogworthy combination. So…yeah, stressed. I’d elaborate, but I’m pretty sure we’d all really rather hear about something called a Honey, Fig and Rosemary Cake, right? Thought so. Anyway, it sh0uld just be easier. Ok, let’s get weird. Preheat your oven to 350°F (yes, you’re using your oven, yes it’s worth it like crazy). Grease a 9-ince springform or regular cake pan. If you’re using a springform pan, make sure you really grease it, or else it will be a pain in the backside to remove the actual baked cake, and you’ll let loose a string of incredibly creative and incredibly bad, bad words. This is a classy cake, so you don’t really want to be throwing around non-classy language. You may have noticed that I’ve tweaked some parts of the recipe a bit, which I often do because it’s fun and because I sometimes forget to buy one–ONE– ingredient called for in the original. In this case, I’ve opted for lemon zest. With this, we’re going to make a rosemary-lemon sugar, and because of this, you’re going to love me. Now, you can either pulse together your lemon zest, sugar and rosemary until completely blended or toss in a small bowl and set aside. I opted for the latter, because tossing stuff is easy and I do not own fancy contraptions. In a medium-sized bowl, sift together flour, baking powder, baking soda and salt, and set aside. In a large bowl, beat together butter, oil and rosemary-lemon sugar with a hand mixer on medium speed until fully incorporated and light. Beat in the eggs, one at a time, then add your honey and mix just until combined. 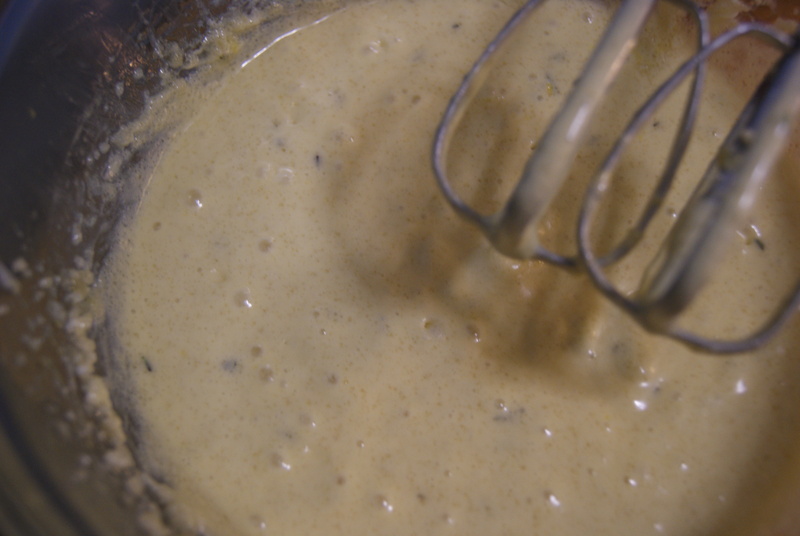 Now, with the mixer on low, alternate between adding in the flour mixture and adding in the milk. Make sure everything’s mixed together fully. Add in vanilla and then beat for another 10 seconds or so. Oh, if you’re not crying out “MOTHER OF PEARL, THIS SMELLS AMAZING!” by now, you either hate rosemary or forgot something. Re-check, then proclaim your joy. 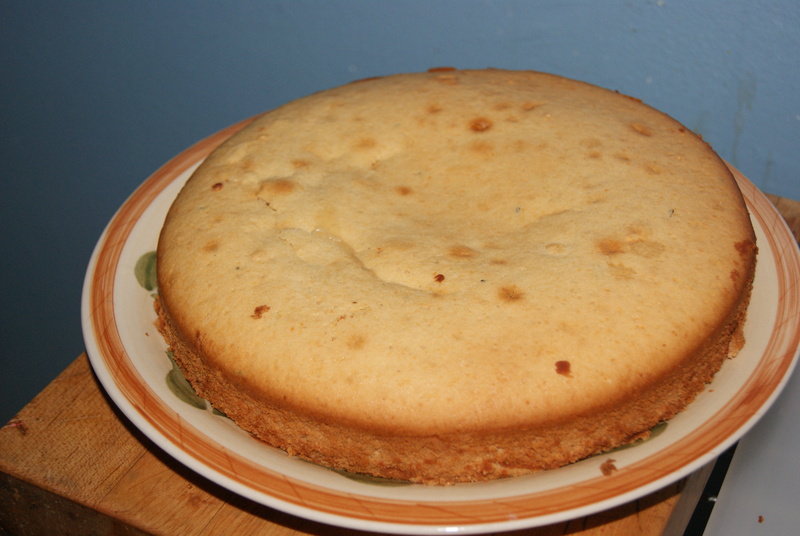 Using a rubber spatula, scrape all of the batter into your greased pan, then send into the oven for 40 to 45 minutes, rotating the cake about halfway through the process, and bake until a toothpick inserted into the middle of the cake comes out clean. Cool in the pan for 10 minutes, then remove cake from pan and let it cool on a rack for about an hour. Now, to make the figs. Melt your butter in a large skillet over medium heat until it begins to brown and smell a little nutty (YOU SMELL A LITTLE NUTTY!). Add in your figs and season with a bit of salt and pepper, to taste. 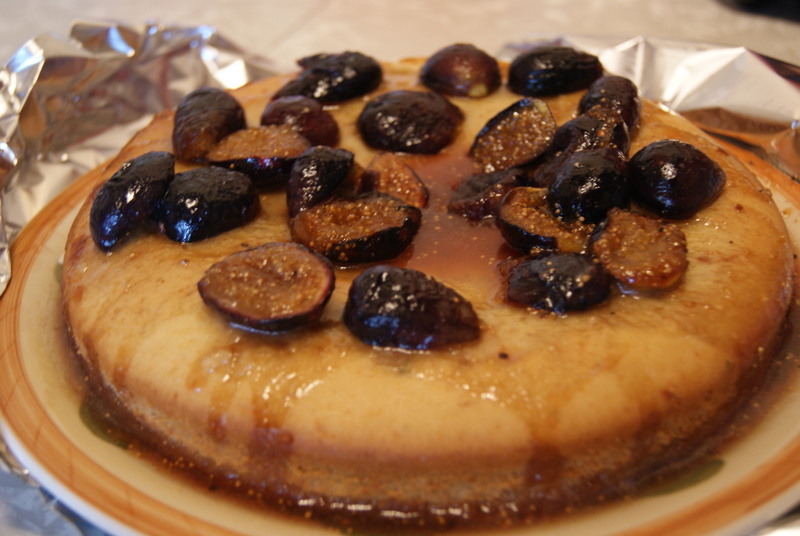 Cook for about 3 minutes, until the figs start to soften. 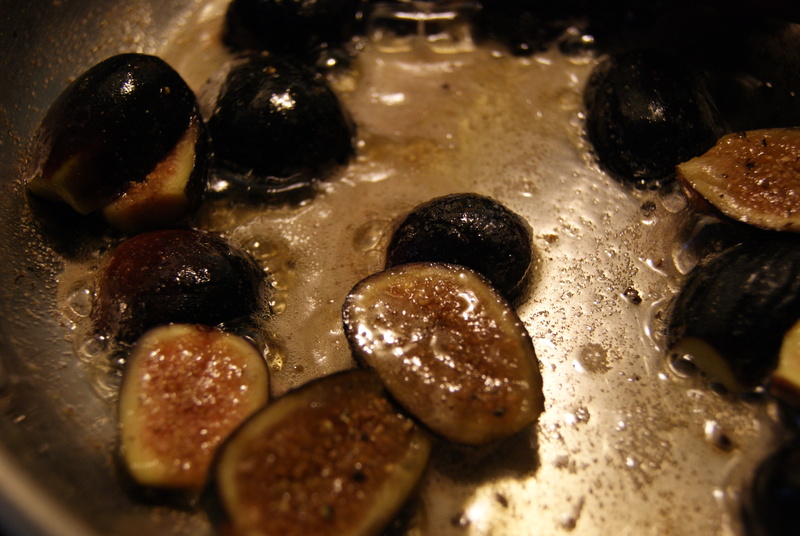 Stir in your honey and remove the figs from heat. Level the top of the cake a bit (this is optional, to be honest), then pour your fig-honey mixture over the top, making sure the round is as evenly covered as possible. Serve immediately. So, on to the verdict. I elected to level the cake top a bit, mostly so that I could have an excuse to try the actual cake. I am a person with little self control when it comes to sweets. This is my curse. This is my blessing. Anyway, OMG. 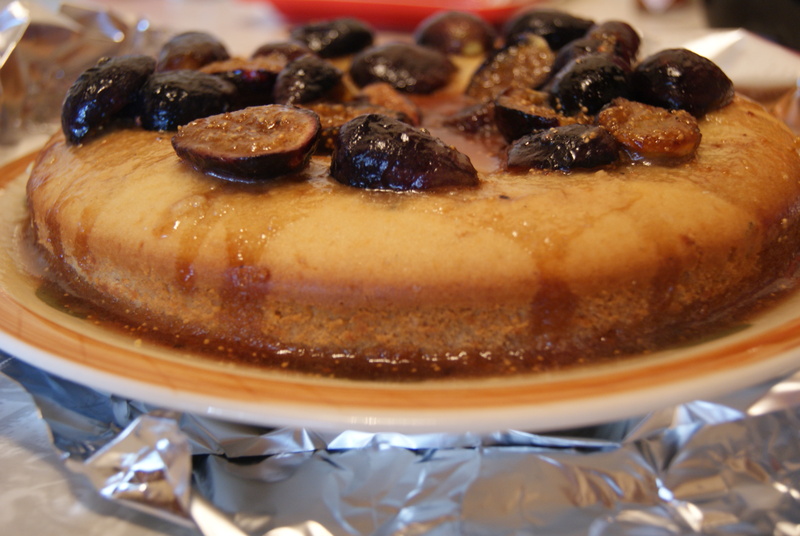 The cake was moist, sweet, fragrant and had the perfect, perfect hint of rosemary. I kind of need it in my life again, right now. I mean…you’re seeing this right? Imagine tasting it. Oh, you can’t imagine it? Then MAKE THIS. Make it, now. Please make it now. Invite me over, and we’ll make it together. Even Almond Joycha liked it! God, I miss this cake. ← Frozen Boozy Fruit Pops. Or Sangria Poptails, If You’re Feeling Fancy. Intriguing. Honey, fig, and rosemary. That all sounds good to me! Hey don’t your parents have a fig tree in their backyard now?